We squashed a few bugs to improve your playing experience. Dive back in to make a splash! Dive into Jammer Splash! The all new match 3 puzzle game from Big Blue Bubble, the creators of My Singing Monsters! Match blocks of the same color and pop them to solve the match 3 puzzle, but watch out it’s a race against time and your number of moves is limited. Don’t worry though, t... see more Dive into Jammer Splash! The all new match 3 puzzle game from Big Blue Bubble, the creators of My Singing Monsters! Match blocks of the same color and pop them to solve the match 3 puzzle, but watch out it’s a race against time and your number of moves is limited. Don’t worry though, there’s a colorful cast of characters ready to help you out by becoming helpful avatars and powerful powerups that change the board every time you use them! • Easy and fun to play, but takes practice to master! • Collectible Avatars that level up with you and help on your adventure! • Facebook Leaderboards to compete with your friends! • Multiple ways to complete each match 3 puzzle! • More puzzling levels than you can shake a toe at! Thank you for playing Jammer Splash! Jammer Splash is free-to-play, however some game items can also be purchased for real money. If you don&apos;t want to use this feature, please disable in-app purchases in your device&apos;s settings. 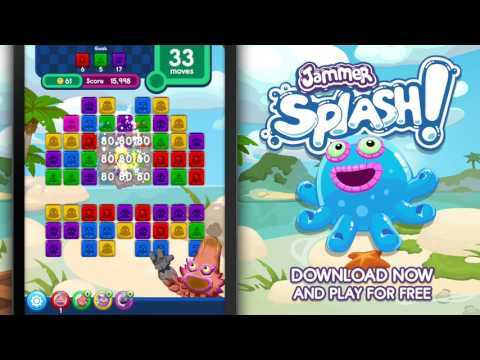 A network connection (3G or WiFi) is required to play Jammer Splash. Help & Support: Visit www.bigbluebubble.com/games/jammer-splash/ or contact us in-game by going to Options > Support.